Which part of Goa will be affected the most with the Supreme Court ordering to shut down liquor outlets within 500 metres of national and state highways? The coastal belt of tourism, the midland or the hinterland? Unfortunately, it is the midland and the hinterland when most of the accidents occur due to drunken driving in the coastal belt. The simple reason is that most of the national highways pass through the midland of Goa and majority of the state highways are either in the midland or the hinterland – even the sanctuaries. And none of the towns will get affected because most of the towns now have by-pass roads, may it be Mapusa, Panaji, Ponda, Vasco or Margao. 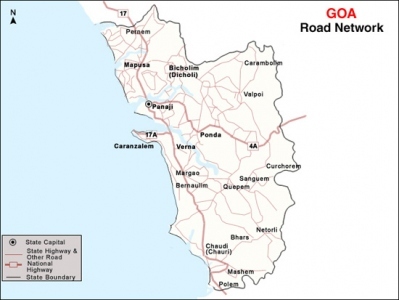 Information gathered from the state authorities reveals that Goa has eight state highways earmarked. 3) Borim, Shiroda, Panchwadi, Sanvordem, Sanguem, Patiem, Zuna. 4) Dharbandoda, Savargal, Sanvordem, Curchorem. 5) Margao, Nessai, San Jose De Areal, Chandor, Curchorem. 6) Cuchelim, Thivim, Assnora, Mulgaon, Bicholim, Sanquelim, Honda, Valpoi. 7) Honda, Velguem, Pali, , Usgao, Piliem. 8) Ponda, Borim, Raia, Arlem, Madgao. NH17: Pernem, Mapusa, Panaji, Margao, Cuncolim, Canacona. NH4A: Panaji, Old Goa, Ponda, Usgao, Mollem. The state highway from Assnora to Dodamarg via Kasarpal joins Maharashtra, from midland to the hinterland. The second state highway joins Karnataka, passing through Mhadei sanctuary, from Sankhli to Chorle Ghat via Poriem and Keri. And the third state highway in the South touches the Netravali wild life sanctuary. This road starts from Borim and goes to Sanguem via Bori, Shiroda, Panchwadi and Sanvordem. Beyond Sanguem town, it passes through a thick forest to join the Diggi Ghat of Karnataka. It does not even a road in good condition and the end point at Zuna is a village which has only two houses of Velip community in a thick forest. The other state highway in Sanguem and Dharbandoda talukas runs from Dharbandoda to Curchorem via Savargal and Sanvordem. The main road from Margao to Curchorem is via Quepem. But it is not a state highway road, but a road passing through the villages of Nessai, St Jose de Areal and Chandor. Yet another longest state highway begins at Cuchelim in Bardez and ends at Valpoi in the hinterland via Thivim, Assnora, Mulgao, Bicholim, Sankhli and Honda. Another mining area road is also a state highway, from Honda, Velguem, Palli, Usgao up to Piliem, little before the Sanjivani Sugar factory. The eighth state highway is from Ponda to Margao, via Borim, Raia and Arlem. Besides this, the National Highway 17 is from Pedne to Canacona via Mapusa, Panaji, Margao and Cuncolim, but bypassing the main towns. The four-lane road from Verna to Vasco via Dabolim airport is the National Highway 17B. And the NH4A is the road from Panaji to Molem via Ponda. According to Excise Commissioner Menino D’Souza, the taluka committees have till now identified 3500 liquor outlets along these roads. Once the list is fully updated within a week, they would be sent notices to shut down by 31 March. Mr Menino Dsouza is not fit to be a EXCISE COMMISSIONER, and in few years time want to become an IAS officer. Any appeal made against the order passed by the commissioner is thrown in dustbin by the Chief Secratary, Government of Goa. Such Excise Commissioner like Menino Dsouza should be dumped from the post.